Hooray! New year can be a dull time as we're all in post Christmas blues, with Summer a complete distant memory and no sign of it in the foreseeable future, it's pretty hard to be upbeat. Unless of course you've booked yourself a holiday - yay. John was quite the little sneak and after we had trawled the web for flights for the four of us, he went back and booked them. So in May we are heading off on our first holiday as a family of four, I'm not looking forward to the flight but I am seriously excited for the sun, sea and sand. I don't take for granted how fortunate we are that my parents actually have a villa in Spain, it makes holidaying so much easier. As we just book flights and airport taxis, and we're good. If we forget something there, they can bring it back with them when they're next over there themselves, or we can give them things in advance to take with them, as they go pretty much every other month. 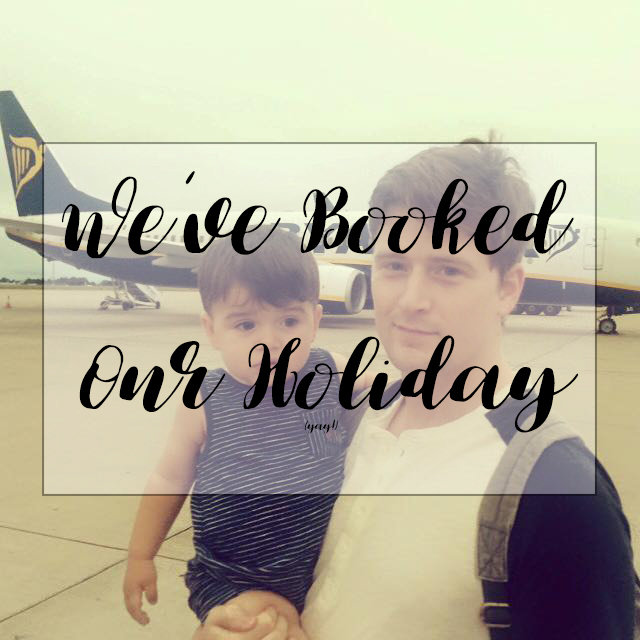 Noah has already been abroad three times, once to Tunisia around 8 months old and twice to the villa in Javea, the little sun bug is also going again in April with my parents before returning once again in May with us. I mean this toddler is going to have more passport stamps than me at this rate. Of course though, this shall be Patricks first time abroad, and while we have always been fortunate Noah was a dream flying, P may not be just that so for moral support, we're taking my Nan along with us. She's really good with both boys and a dab hand at taking care of them so it made sense, plus she wants a little sun herself so why the hell not. It will be lovely to know that maybe once or twice whilst we are out there, me and John might *just might* get to have a nosy around sans children as I'm sure she will be more than happy to watch them for a few hours. This gives me something to really look forward to too, as you may know if you've read my blog for a while, I am on maternity leave and due to return to work later in the year. This means I am quite frankly dreading the months growing closer, however knowing I have a holiday before that, makes it a little more bearable. I went into organisation freak mode last time we were travelling and it worked seriously well, so I shall be doing the same this time. Though I shall make sure I keep you all in the loop, you can expect to see many posts on hand luggage, tips and tricks in the coming months as I prepare to take our smalls abroad. That being said, if you have any similar posts I would love for you to link them as I like to absorb as much information as possible before flying. John engaged some thought and got us the front row with extra leg room already, along with priority boarding so that has eased my mind slightly. Wow - so lovely. You're very lucky! Wish my Mum had a villa! I'm so jealous! We are twitching to book a holiday, but will likely just end up grabbing something last minute. I wish my parents had a villa we could go to though! Very very jealous! I'm sure P will be a brilliant flyer and even if not, Spains a short flight, and he'll have his big brother to keep him company the entire time!